By buying this product you can collect up to 31 loyalty points. Your cart will total 31 points that can be converted into a voucher of £ 0.31. Sabeet beet root is a nitrate source for Nitric Oxide boosting. 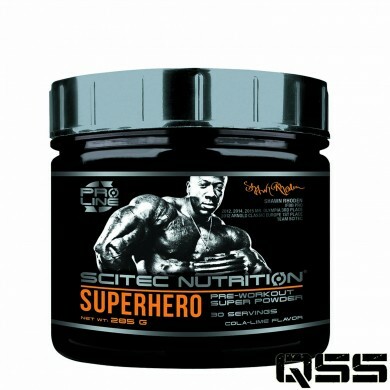 Paired with pure L-Citrulline, which is a superb Arginine and NO booster, the results are spectacular! Kyowa branded Cognizin is Citicoline that’s an essential intermediate in the synthesis of the major phospholipid of the cell membranes, Phosphatidylcholine. Citicoline activates the central cholinergic system. AstraGin is composed of highly fractionated Astragalus and Panax Notoginseng, and it’s synergistic with the other nutrients in Superhero. Glutathione is a highly important antioxidant in the human body. The added 200 mg Vitamin C contributes to the normal function of the immune system during and after intense physical exercise. Contains Caffeine (300 mg per serving)! Not recommended for pregnant women and children! Beta-Alanine may cause a harmless, temporary tingling sensation on the skin for some individuals. Use this product in conjunction with food as part of a healthy, balanced diet, not as a substitute for such. Keep out of the reach of children! DON’T EXCEED THE RECOMMENDED DAILY DOSAGE!